Three, sixteen-year old American girls have won Google’s “global science competition” prize. These three girls leaned that many crops germinate in direct proportion to the presence of a particular bacteria in the soil. Thus, they hypothesized that by increasing the amount of that bacteria in the soil, crops might germinate more quickly and produce greater yields. They tested their hypothesis over a period of eleven months and discovered that by increasing the concentration of bacteria in the soil, some crop yields might be increased by up to 50%. This is no small thing. Increasing crop yields by 3% is interesting and profitable. Increasing crop yields by 50% can save lives. This increase might help feed millions of hungry people. These three teenage girls have achieved a ground-breaking scientific discovery in their kitchens and backyards that’s eluded college-educated scientists working in the multi-million-dollar laboratories of major corporations. Children with little more than laptops, test tubes, seeds, patience and an understanding of the scientific method may have changed the world. Google gave the girls $50,000 college scholarships, a trip to the Galapagos Islands and and an opportunity to participate in a summer program for possible astronauts. Here’s a video of these three teenagers (sometimes wearing ill-fitting laboratory smocks like little girls dressed up in their mom’s dresses and high heels) which explains how they achieved their extraordinary discovery. I don’t know if the world’s major corporations are impressed or terrified. It’s not news, but it’s more evidence that the world of scientific discovery is no longer confined to big money and big corporations. Even kids can change the world. This capacity for individuals defies the ideas of “central planning” and “central control” that underlie the New World Order and global government. 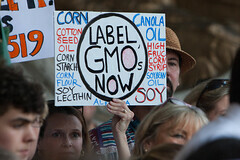 The tide of public opinion is turning against Monsanto and Genetically Modified Foods. The film below is evidence of that turn. But, as the film explains, the problem is not simply Monsanto and other big, multi-national corporations. The problem goes to government being compromised and bribed to support the corporations rather than the people. It’s all about the money, not the food or the health or the people. Today, we are presumed to live in an “economy” (based on “money”) rather than a nation (based on moral right and wrong). These two different systems (economy vs. nation) result in two different systems of values. When your social system is an economy, your values becomes skewed to favor profits. When your social system is a nation, your system of values is skewed to favor people.